Extra-large, wild caught Cod fillets in panko breadcrumbs. Bring chef-inspired gourmet flavors to your kitchen. Expertly seasoned with aged parmesan cheese and just a hint of black pepper, our Parmesan Crusted Cod will have everyone wondering where you went to culinary school. UNCOOKED. KEEP FROZEN UNTIL READY TO COOK. Remove fillets from packaging before cooking. 1. Preheat oven to 425˚F. 2. Arrange on metal baking pan. For best texture, place fillets directly on pan or use parchment paper. Foil is not recommended. 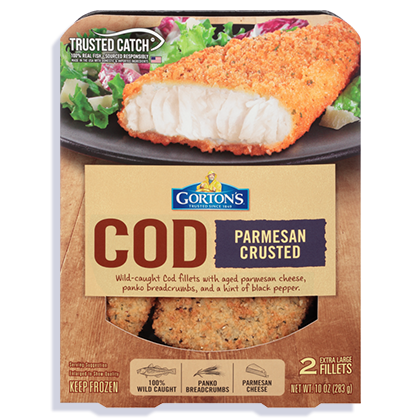 INGREDIENTS: Cod fillets, breadcrumb coating, canola oil. Cod, sodium tripolyphosphate (to retain fish moisture). Wheat flour, water, yellow corn flour, sugar, parmesan, romano, and cheddar cheese (milk, cultures, salt, enzymes), salt, whey, maltodextrin, black pepper, yeast, baking powder (baking soda, sodium aluminum phosphate), parsley, natural flavor, cream, colored with paprika, annatto, and turmeric extracts, lemon juice solids, malic acid. 170mg of EPA and DHA Omega-3 fatty acids per serving.